The Doll Family was perhaps the most famous and successful group of little people to grace popular entertainment in the 20th century. Out of a family of seven children born to Emma and Gustav Schneider in Stolpen, Germany, four of those children were midgets, which is an exceedingly unusual phenomenon to occur in a single family. Those four children were smaller than average, but also proved to be talented performers. In their early years, the Schneider's met with success performing a song and dance routine in Europe. Sometime between 1913 and 1915 (accounts vary), manager Bert W. Earles encouraged Kurt and Frieda to venture across the Atlantic to America. They appeared on the Buffalo Bill Show as “Hans and Gretl, The Smallest Dancing Couple in the World”, a name which capitalized on both their size and nationality. Later, Kurt and Frieda changed their professional names to “Harry” and “Grace” and adopted the surname of their manager, Bert Earles. 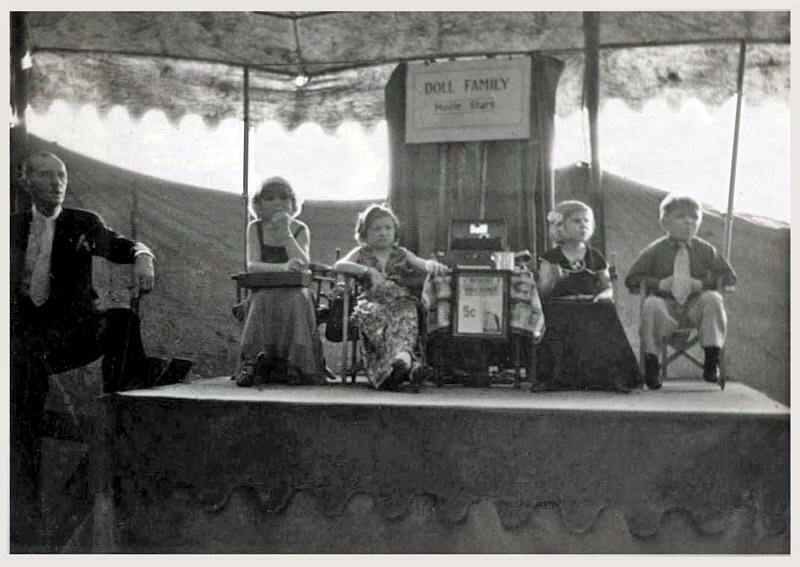 They would retain that name until Mr. Earles died during the 1930's, when the tiny performers became the Doll's — a name which reflected comments overheard from their audiences. In the early 1920's, Harry and Grace were joined in America by their sister Hilda, who now became known as "Daisy". Sister Elly joined her siblings in 1926 and quickly was dubbed "Tiny". By this time, the entire family was working for the Ringling Brothers and Barnum and Bailey Circus. They would work on the Ringling sideshow for the next thirty seasons, with the exception of the 1952 season when they were replaced by members of Nate Eagle's Midgets. In addition to their live appearances, the Dolls racked up quite an impressive number of film credits, which allowed them in later years to dub themselves “The Moving Picture Midgets”. Various Doll family members had starring roles in The Unholy Three (1925 and 1930), That's My Baby (1926), Baby Clothes (1926), Baby Brother (1927), Special Delivery (1927), and the Laurel and Hardy short feature Sailors Beware (1927). Today, the Doll family will be best known for their appearances in Tod Browning's infamous Freaks (1932), and the much beloved The Wizard of Oz (1939). In Freaks, Harry plays the leading role of Hans, the sideshow midget who is seduced away from his loving fiance Frieda (portrayed by Harry's sister Daisy) and then poisoned by the evil trapeze artist Cleo, who wishes to gain the little man's wealth. Hans survives this attempt on his life and reunites with his betrothed while fellow sideshow performers exact their revenge on Cleo. The Earles family played much lighter fare in The Wizard of Oz, with each of them becoming citizens of Munchkinland. The ladies filled various roles as Munchkin maidens, but Harry will be immediately recognized as a member of the Lollipop Guild. Following their foray into film, the Doll's returned to the circus, where they were staple attractions through the late 1950's. When the Ringling train shows ended in 1956, the Doll's started touring with the Christiani Circus, living in a trailer they pulled behind their car. The Doll's found this to be an unacceptable situation, so in 1958 they jointly retired. The siblings continued to live together in the large home they owned in Sarasota, Florida. Grace passed away in 1970, followed by Daisy in 1980, and Harry in 1985. Tiny outlived the rest of the Doll's, but died in Florida at the age of 90 on 6 September 2004.